When we say Stanbic Bank is probably the most corrupt bank in Africa, we do not exaggerate. In Zambia, Stanbic is engaged in bribing judges to destroy local companies and government officials to win contracts. Stanbic does the same wherever it operates. 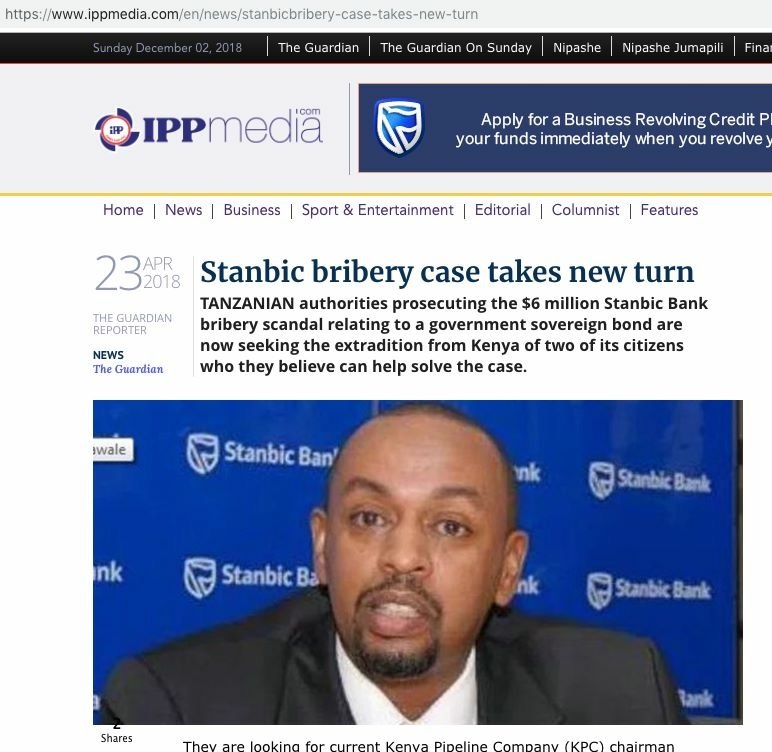 In Tanzania, Stanbic has been found guilty of bribing Tanzanian government officials with over US$6 million. This Stanbic bribery scandal started in 2013 when the Tanzania government sought an external borrowing of $600 million through bonds. The $600m private placement of sovereign debt was for financing electricity, water and other infrastructure work in Tanzania, part of the government’s five-year development plan. To beat other banks and be appointed lead bond executioners, Stanbic engaged in what it knows best; bribery and extortion. Stanbic bribed government officials using US$6 million. This attracted the attention of UK’s Serious Fraud Office (SFO) since Tanzanian police and courts could do nothing as they were also part of government officials bribed by Stanbic. Even if the crime was committed by Stanbic branch in Tanzania, UK’s Serious Fraud Office charged Standard bank headquarters in South Africa. 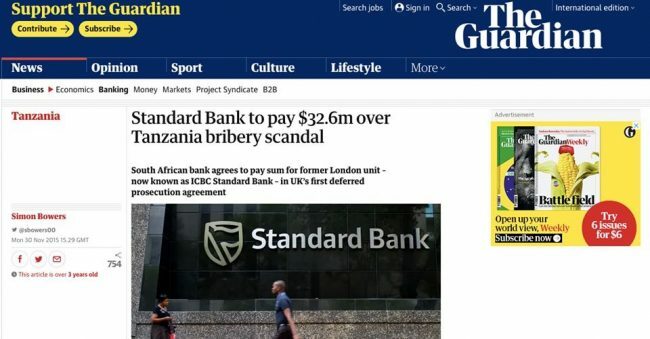 In the case, the UK’s Serious Fraud Office (SFO) charged the Standard Bank for failing to prevent the bribery on its Tanzania’s subsidiary, the bank pleaded guilty and agreed to pay a number of fines including the $6 million to the government of Tanzania. The bank pleaded guilty and agreed to enter into a deferred prosecution agreement, which basically means that, the bank should pay fines so that its officials are not arrested. The SFO investigations confirmed that a bribe of $6 million was paid to government officials through a local company, EGMA, in March 2013, to enable Stanbic/Standard Bank to get favour as the lead bond executioners. The chairman of EGMA is former commissioner general of Tanzania Revenue Authority (TRA). The arrangement of the pay-out was done by then Stanbic managing director Bashir Awale who was later relieved of his duties and Ms Shose Sinare, the banks corporate affairs official who later resigned. ‘Standard Bank agreed to pay $6 million compensation to Tanzania based on the calculated harm to the country. But compensation may have been well over ten times higher—possibly as high as $80 million— if the full harm to Tanzania had been taken into account,” Corruption Watch, a International NGO observed. “The bond was unrated and unlisted, and drawn up in a way that was of interest to a limited number of investors. 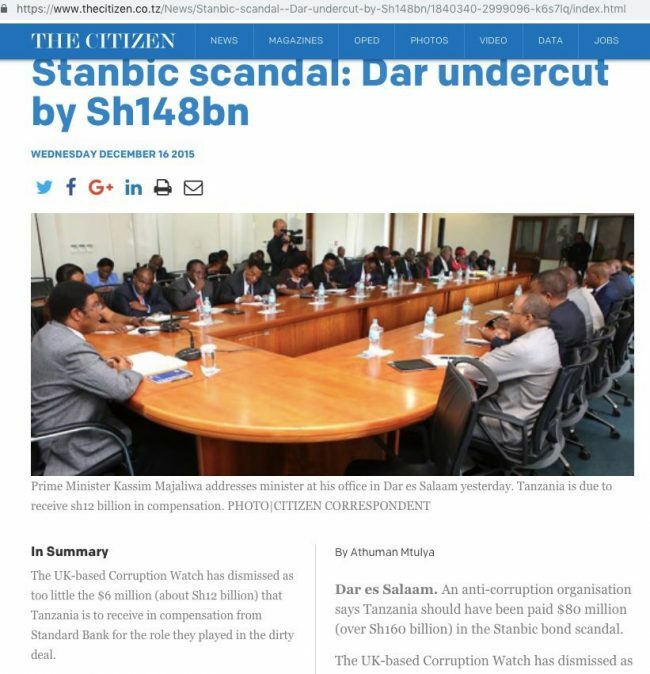 It has also been suggested to Corruption Watch that the bond issued by Standard Bank resulted in a potential additional cost to Tanzania of more than $80 million in excess interest and fees when compared to more traditional financing forms which were proposed to the government of Tanzania at the time. Corruption Watchd said Evidence as to the full financial loss to Tanzania would have been crucial to a fairer compensation order to Tanzania, which has been left with a large debt for a badly priced bond, which was arguably mandated by the government of Tanzania in part because of the bribery involved,” reads the analysis. In Zambia, Stanbic is currently involved in bribing judges in a case revolving around a local company Savenda Management services. In this case of Savenda v Stanbic, the High Court ordered Stanbic to compensate Savenda K192m for loss of contracts after Stanbic negligently and maliciously reported Savenda to the credit Reference Bureau. But the Supreme Court trashed the High court Judgement and instead ordered Savenda to pay costs from the time the case started, generating public outcry and suspicion that the Supreme Court has been bribed. Then evidence emerged that Supreme Court judges were biased and so aggressive against Savenda because they received bribes from Stanbic through the bank’s lawyer Eric Silwamba prompting a public outcry. He was found ‘guilty’ and sentenced to six years in jail with hard labour by the same judges who were also the accused persons, the witnesses and prosecutors. Chifire fled into exile and is said to be in Latin America where he has been given sanctuary.